For shelter and protection, a prefabricated canopy can offer many benefits for a wide variety of applications. Whether you need to designate an area of your facility for truck inspections or you’d like to create an ID inspection space, a canopy can delineate the space and provide protection for employees and visitors. Learn more about the benefits of adding a canopy to your facility in today’s blog, below. There are many reasons why a canopy will benefit your facility. When you need to know who has been coming into and out of your facility, you need an access control point to monitor and manage the movement of employees and visitors. An entrance canopy provides the ideal solution. In the event that you manage a military facility, you’ll need to ensure that your entrance canopy meets all of the requirements of the UFC 4-022-01 Anti-Terror/Force Protection regulations for entry control facilities/ access control points. At Shelters Direct, we have extensive experience providing canopies for a variety of military uses that are in-line with all rules and regulations. When you need a space for vehicle and truck inspections, you’ll want to protect the vehicles and drivers from inclement weather. Prefabricated canopies offers the ideal solution. Our canopies have been used at Fortune 500 secure facilities, the Department of Defense, and a variety of government facilities, so we have the experience needed to provide the right truck inspection canopy for your needs. Canopies can be customized in a variety of ways in order to meet the specific needs of your facility. Whether you require flush mounted lighting or architectural and design modifications to match the aesthetic of your facility, we can create the ideal prefabricated canopy for your application. 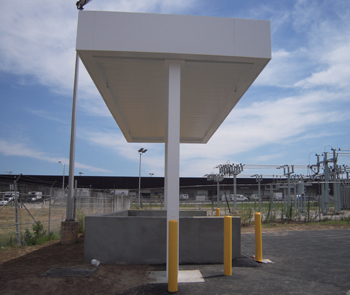 Shelters Direct has been a trusted source for the supplying and installation of canopies, shelters, and prefabricated guard booths for over 20 years. We work with a wide variety of clients throughout the United States and abroad to provide quality products and expert installation so you can be confident that we will get the job done right. Interested in learning more about how a prefabricated canopy could benefit your business or government facility? Contact us today! And don’t forget to keep up with us on Facebook, Twitter, Google+, and LinkedIn too. This entry was posted on Friday, May 6th, 2016	at 9:51 am	. You can follow any responses to this entry through the RSS 2.0	feed. Both comments and pings are currently closed.